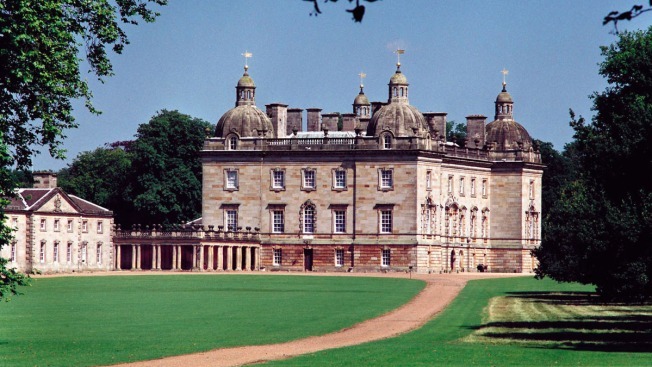 This photo provided by Museum of Fine Arts, Houston shows Houghton Hall in Norfolk, England. Artwork and furniture from the grand English country house Houghton Hall are going on a U.S. tour. "Houghton Hall: Portrait of an English Country House" opens Sunday at the Museum of Fine Arts, Houston. It will be on view through Sept. 21 before traveling to San Francisco and Nashville. The show, which marks the first time the collection has traveled outside of England, includes more than 100 objects in settings that combine paintings, porcelain and furniture. The house was built in the early 1700s by England's first prime minister, Sir Robert Walpole. His old master paintings were infamously sold by his grandson to the Russian empress Catherine the Great in 1779, but descendants added to the collection. The exhibit features loans of some of those paintings sold to the czarina.